The atmosphere at St Stephens Anglican Church Amii-Akabo in Ikeduru Local Government Area of Imo state was in a sober mood as the funeral service in honour of the late parliamentarian of great esteem, Rt. Hon. Bethel Nnaemeka Amadi was going on. The moderator of the service and the Lord Bishop of Ikeduru Anglican Diocese Rt. Rev. Emmanuel Maduwike was in the spirit and admonishing the congregation which had in attendance, the movers and shakers of the society. The PDP vice Presidential Candidate, Dr. Peter Obi, Bayelsa State Governor, His Excellency Seriake Dickson, Imo Governor - elect, Rt. Hon. Emeka Ihedioha among others were well seated. Something happened immediately the Bishop sited the Iberiberizim crooner, His. 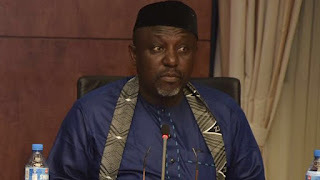 Excellency Owelle Rochas Okorocha and mentioned his name, a volcanic eruption took place inside the church as all who were present voiced their rejection at the man some people described as Cain, who came to rock their peaceful boat. The people shouted, Jideya and Iberiberizim at the man who had once bamboozled Imolites with his tagline, MY PEOPLE! MY PEOPLE!. Something baffling was that, none of the seated dignitaries, stood up to exchange pleasantries with the Emperor who has lost touch with reality. The crowd booed him right inside the church for over 10 minutes. The bishop in his wisdom handled the situation as a mature man and refused giving any politician present the microphone to talk. Because hell would have been let loose if Okorocha was given microphone to talk. Okorocha was rejected in the presence of Imolites and visitors alike. Okorocha was a shadow of himself throughout the service as he sat glued to his seat.